Tajpur, the untouched beauty and latest addition of travel spot in West Bengal is located in East Midnapur, almost 180 kms away from Kolkata. It is one of the most natural beaches in India. Tajpur is situated on the Kolkata – Digha route and just 5 Km from Chaulkhola (way to Mandarmoni – another virgin beach in West Bengal) and surrounded by beautiful water body and forest. It is one of Bengal’s recently discovered tourist destination that lies close to Digha and Shankarpur. 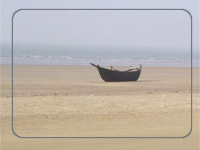 It is one of Bengal’s recently discovered tourist destination that lies close to ever-popular Digha and Shankarpur. This beach is slowly becoming popular among the tourists, although the beach here is usually exposed only when the tide ebbs. 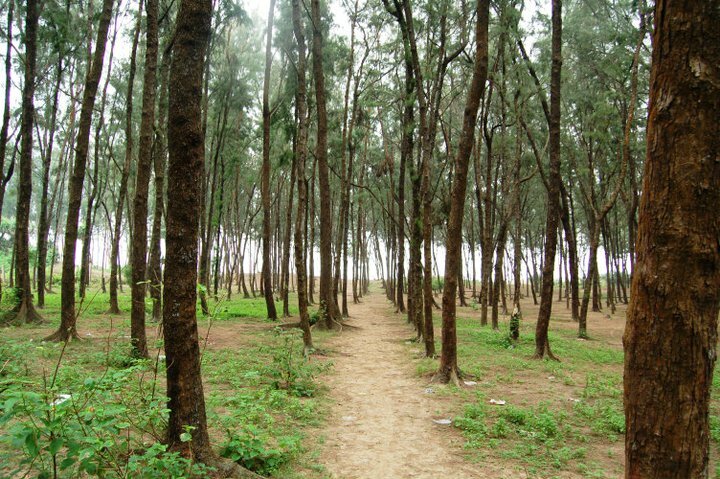 The casuarina trees, kissed by the gentle breeze at Tajpur are a soothing sight. The exotic beach fringed with a dense forest of tamarisk trees are bonus here. A one km walk will take you to a lagoon with really breathtaking surroundings. Take a bus from Esplanade (Kolkata) & get down at Chaulkhola or Baishali which will take about 4 hrs. 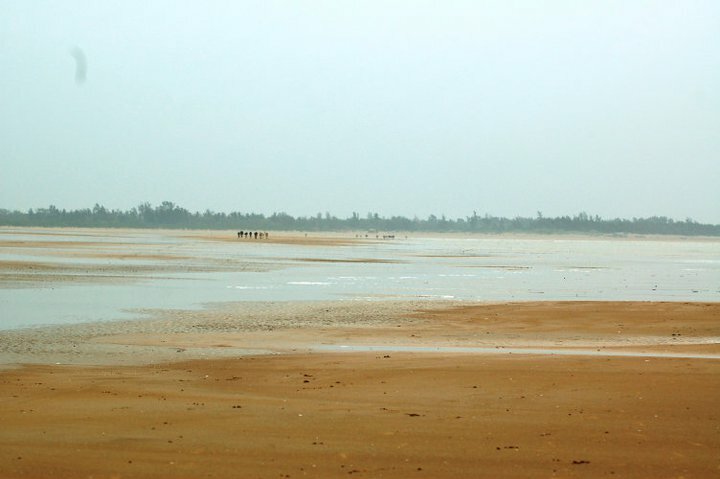 The beach of Tajpur is the main attraction of the place. You may gaze the sea and enjoy the gentle breeze or take leisurely walks on the beach or go for a picnic in the fir tree plantations. You will find casuarina trees and also may see the red crabs on the beach. Most of the hotel will serve Bengali food and Chinese cuisine @ Rs 250/300 for the entire day ( Bed Tea, Breakfast, Lunch, Veg Snacks & Dinner ) For special food need to inform them in advance. Vegetarians, have to inform the hotel in advance so that they can keep the stock beforehand. Though winter is the best time to visit Tajpur, but monsoon can also offer something extra. Don’t forgot to take some mosquito repellent lotions. And as the place is yet to be facilitated with electricity and most of the hotels runs on Generator, take necessary equipments too. This entry was posted on Wednesday, May 12th, 2010 at 12:08 pm	and is filed under General. You can follow any responses to this entry through the RSS 2.0 feed. You can leave a response, or trackback from your own site. please get in touch with 9830788403. “Tajpur Retreat”-A full-size scar on the face of Tourism of West Bengal. Tajpur is coming up rapid as a tourist destination in West Bengal near Digha, and “Tajpur Retreat” the disreputable lodge will surely contribute in walking backward from development of the place. The owner Mr. D. Ghosh (9830271064) is a big time fraud (Chitingbaj) doesn’t hesitate to trouble his guests with all sort of nuisances. And yes one must be ready to face the muscle power if he protests. Food is horrible and you could spot few cockroach and other insects in your platter at ease. Rooms are more than filthy (All snaps posted are fabricated). Staff behavior is like they are favoring the guests just by allowing them to stay. And to top everything Mr. D. Ghosh can easily ask you for a 50% higher rate than the agreed deal on everything at the time of check out, you deny you face the barbarism of his deployed muscle men. You’ve to pay before you check out. Tajpur is a good place But “TAJPUR RETREAT”!!!! No!!! Never!!! Do not ever visit TAJPUR RETREAT if you don’t want to have a horrible experience and an upsetting weekend. Please find some photographs from Tajpur from the above link. Its really a rapid growing tourist spot for those want to spend weekend at lonely sea side. There are some good hotels like Swapnapuri, Naturecamp. But never think about Tajpur Retreat, You would find yourself in big problem especially if you are with your family. Pls. send me the beach photo, hotel photo & natural beauty and all tarrif & hotel contact no. of Tajpur. Biplabda Thanks for your information about Tajpur Retreat Hotel. I m planning to go there. Every should avoid this hotel.